All your daily omegas from a single plant seed oil that is better than flax & not from fish? 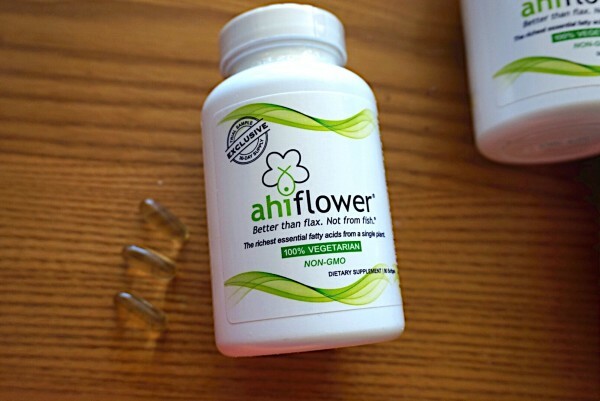 This, my friends, is a product called Ahiflower®. If you’re like me… “Ahiflower” may be a new word to you. Before doing my research on this product, I truly didn’t know anything about it. I dove in, deep, to make sure that this product I was about to review went along with my day–to–day and came from a trusted source. 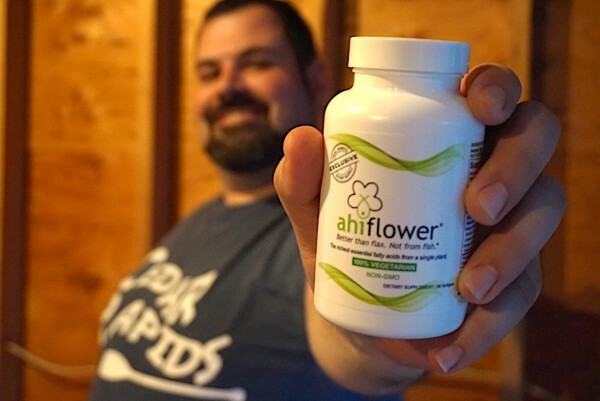 I had an awesome time learning & getting to know my new friend, Ahiflower, and found out some pretty cool facts that may be new and appealing to you! Ahiflower® oil is a nutritional supplement and food ingredient from a plant with the Latin name Buglossoides arvensis (say that 3x fast!) recorded as far back as 1597 in Gerrard’s Herbal that delivers a unique and unparalleled combination of essential omega 3, 6, 9 fatty acids—essential for health, vitality and wellness. Its unique and unparalleled healthy fatty acid profile attracted Natures Crops International (NCI) to embark on developing it out of the wild as an agricultural crop that could be produced sustainably, reliably, and cost effectively by farmers. Ahiflower is the commercial name given to this wonderful plant, derived from the Hawaiian word ‘Ahi’ for Yellowfin tuna. In the same way that yellowfin tuna or ahi tuna is a benchmark for good sushi, so Ahiflower is the benchmark for healthy nutritional plant oils. NCI believes that Ahiflower® oil is the healthiest, most sustainable and scientifically proven plant seed oil that can deliver all your daily essential fatty acid needs. 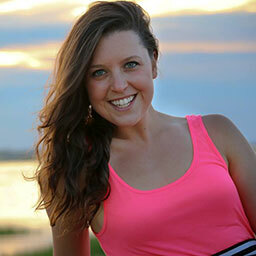 Why do we need essential fatty acids (EFAs)? Essential fatty acids (EFAs) are needed for a healthy body and a healthy mind. They are called “essential” because our bodies cannot make them. We have to get them in our diet. With over 30,000 scientific studies supporting this fact, there is consensus among health care professionals that achieving a minimum daily dosage will have positive health outcomes. While consumption of essential fatty acids can occur with daily food intake, not all EFAs are metabolized equally in the body. SDA in Ahiflower oil converts more efficiently to EPA, one of the key fatty acids found in fish oil. Unlike the omega-3 alpha-linolenic acid (ALA) found in most plants, Ahilower oil contains the omega-3 stearidonic acid (SDA) which our bodies convert more readily to EPA at a rate of up to 30%, compared to a typical conversion rate with ALA of only 3-6%. Thus much larger quantities of ALA oils (such as flaxseed oil shown below) are required to achieve the same benefit. Ahiflower oil has the highest level of SDA compared to other naturally occurring plant sources, providing approximately 60% more SDA than echium oil and 6-10 times more than hempseed oil. Where does Ahiflower Oil come from? All Ahiflower is grown in the UK by a group of independent farmers, all sharing the same Ahiflower mentality by being passionate about cultivating healthy, sustainable crops that promote the health of families globally and also preserve our ocean’s ecosystems. NCI states that they are growing a crop that will change the world and provide healthier people, abundant oceans, and peace of mind over quality and safety. 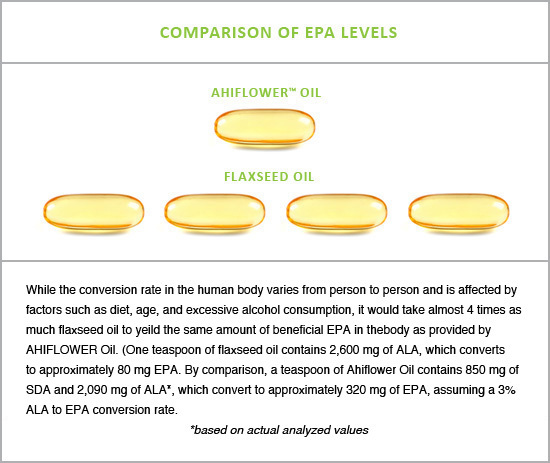 In 2014, Ahiflower Oil was evaluated clinically by the University of Moncton (Canada) in a randomized, double-blinded comparator controlled trial designed to measure the difference between consuming Ahiflower oil and Flaxseed oil in terms of long-chain (EPA) accrual in circulating cells. 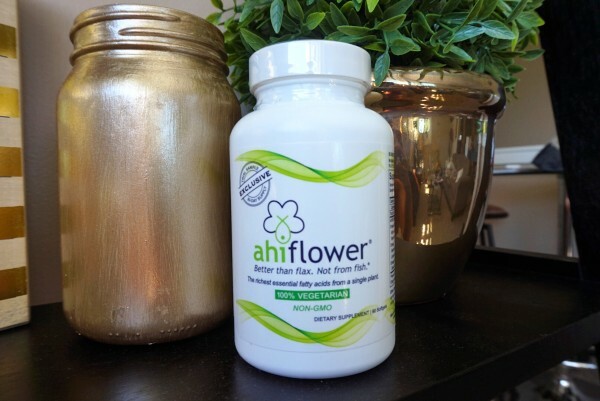 The results of this trial showed that Ahiflower oil converts to EPA in circulating cells up to 4x more efficiently than flaxseed oil after only 28 days. 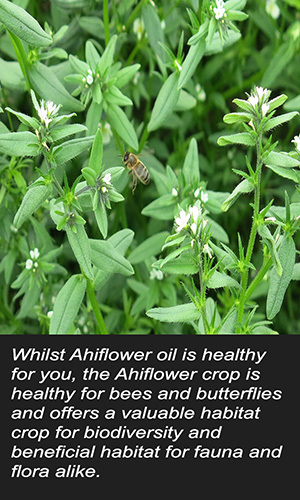 Consumers can take Ahiflower oil with confidence, knowing that it has a meaningful and scientifically proven background. 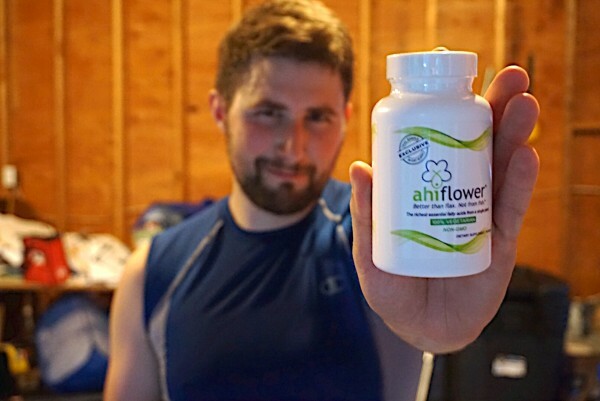 Keep an eye out for my next post featuring how 2 clients of mine, Danny & Kyle, took the Ahiflower Challenge over a 3 month span in addition to their training and will be answering a few questions as to how they feel and their thoughts on Ahiflower. I will also be hosting a GIVEAWAY on the next post with Ahiflower! Ahiflower is a safe, clean tasting, sustainable, vegan, and traceable omega-rich oil – unlike any other source! It’s hella better than flax, and it’s not from fish. If you want to boost your healthy EFAs and not disturb any fish, you’ve found a friend too! 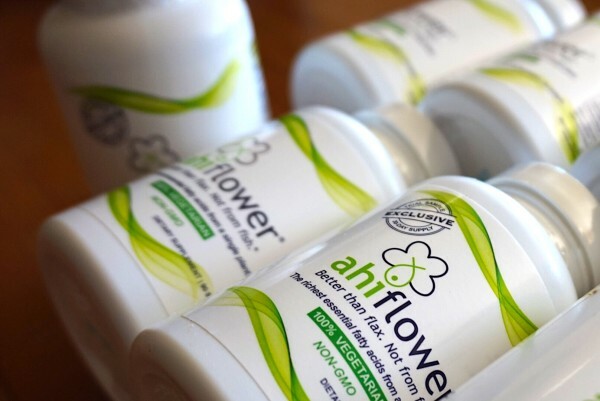 You can find Ahiflower on Twitter & Facebook!